It really came home to me this year how much fun Christmas is when there are children in the house. For so many years we've had an "adult" Christmas, and while it's certainly fun, it doesn't hold a candle to the excitement when there are children around. At least there were some knitted gifts under the tree! 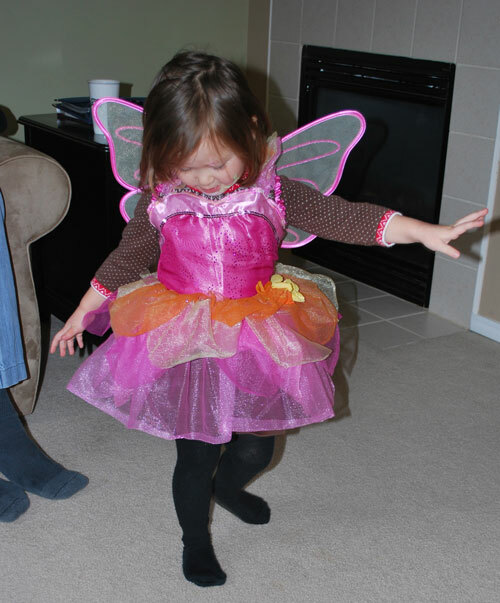 Our gift to Mei-Mei was a little pink fairy costume and it was a big hit! On my end, yarn and IOU's were gifted! Hubby received a box of yarn for a Cambridge Jacket. He liked Ben's so much that he needed one of his own. I wasn't sure of the color and he requested something different than was in the box, so it has been returned and a nice charcoal grey heather has been ordered. I gave my sister an enrollment in the "2011 Sock of the Month Club", which entitles her to one sock each month for a grand total of six pairs this year. I'm already ahead of the game! This is Sunshine by Cookie A. I seem to have misplaced the ball band, but as soon as I locate it I will update the information on my Ravelry page. 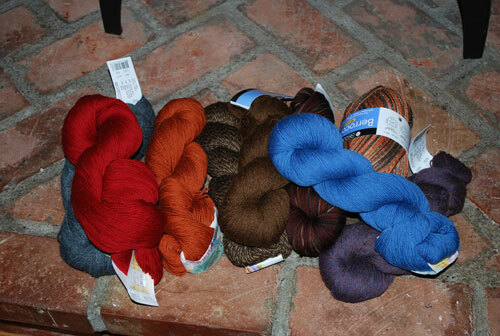 Hubby came through big time with a gift certifcate for our LYS, along with a post-it note informing me of a big after Christmas sale. My original intention was to get yarn for a sweater for me, but there wasn't enough of any of the yarn I wanted so I splurged on sock yarn! This should keep me occupied for a long time!! 1. Dejunking and destashing. I really seem to be a pack rat when it comes to magazines. I've been collecting Quilters' Newsletter since the 70's and it's time to bid them adieu. I'll be selling the earlier editions, which have some collector value, on eBay. The rest I will go through and tear out any patterns I want and file them in a notebook. Then off to recycling they go! This is a HUGE step for me! This is also part of a redecorating and clearing out of my sewing room, which includes a new paint job and wood floors. 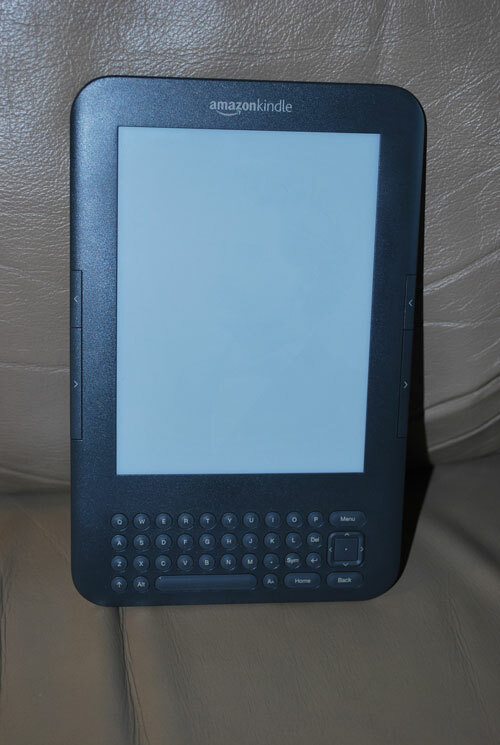 Hubby questioned why a Kindle when we already have an iPad. There were several reasons: The price has come down considerably. Even books are getting cheaper. I got a New York Times best seller for only $5.00. The iPad is definitely much better as an all around tool, especially for web browsing and playing games, but the Kindle is much, much lighter. I can even throw it in my purse. I don't have to share. The iPad belongs to both of us and often when I want it, hubby has it. I can be selfish with this! Of course, there are the usual diet and exercise goals. I think I'm going to approach it a little differently this year. Each month I'll set a different diet and/or exercise goal for the month rather than trying to look ahead for the entire year. I don't need any drastic changes; I just need to instill a few healthier habits. For January my goal will be to add more fruit to my diet. Hopefully this will help replace my unhealthy attraction to sugar! Off to spinning group today. I haven't really done much spinning in the past few months. With my sewing room out of commission, it will be nice to have something besides knitting to turn to. Happy New Year to all of you!! Christmas is all about preparation, but I think we've come a long way from the initial preparation that announced Christ's birth. Usually I don't get too crazy, but I've had to keep reminding myself this year to put on the brakes and not try to "do it all"! 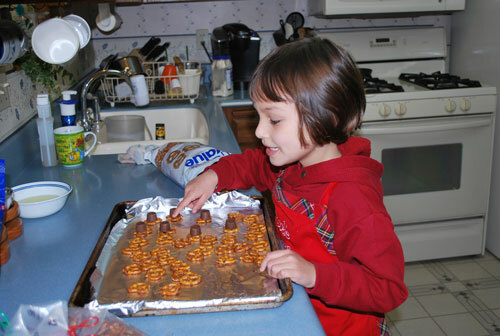 A fun part of preparation this year was having the girls to help us. We had them over the weekend so that their parents could have some much needed R&R. 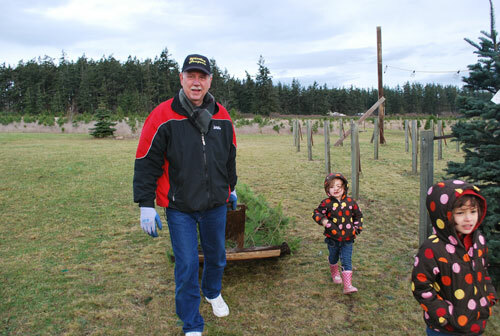 Earlier in the week hubby had gone out and picked out a tree at our local Christmas tree farm and put their names on it. On Saturday we ventured forth in the cold, biting wind. The girls were told we needed to find a tree with their names. They were very excited to find it. Isobel shouted "Timber!" as we cut it down. You can see from Mei-Mei's face how cold the wind was. When we got it home, hubby got it all set up and the lights put on and then Isobel and I decorated it. Mei-Mei was supposed to help, but when I looked around, she was gone. I found her in her bed, fast asleep! 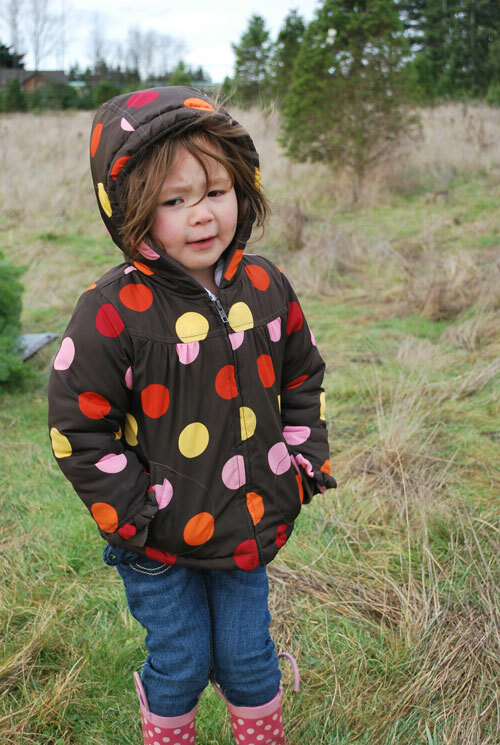 Picking out a Christmas tree is hard work. 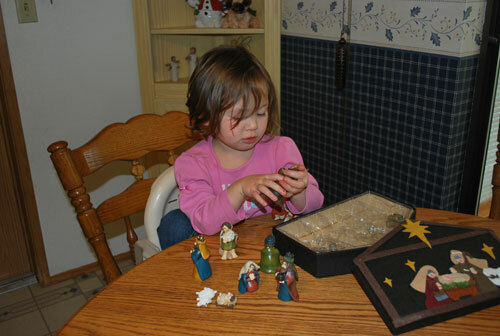 After a good nap, she was content to play quietly with the Nativity Set while Isobel and I made turtles. Later in the afternoon we went to the local Christmas village. The highlight for both girls was feeding the animals. Mei-Mei especially liked the alpacas. 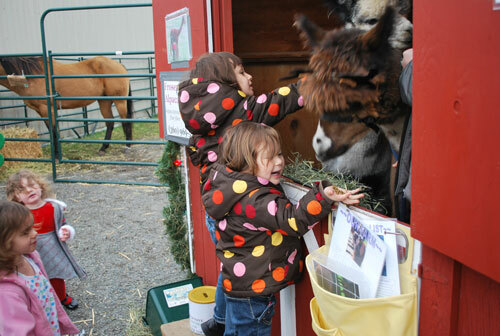 She giggled every time the alpaca took the grain out of her hand. At one point in the weekend I had left my sock knitting on the couch. Mei-Mei very gently picked it up and brought it to me. "Here Nana – you need to put this in your knitting basket so I can't find it." 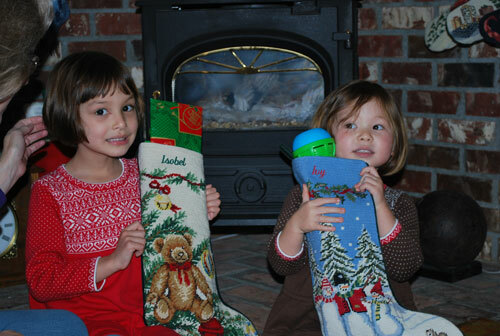 We're so looking forward to having Christmas with them and their parents again this year. We try to keep the gifts to a minimum and instead focus on Christ's birth and the importance of family. 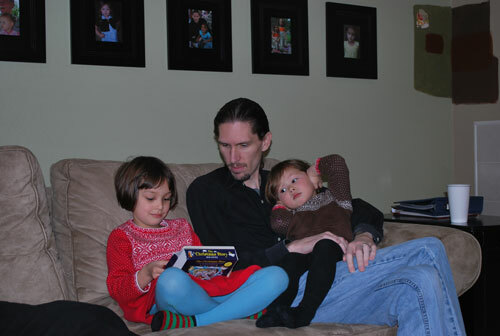 Every year before we open gifts we read the Christmas story. A different family member reads each year. 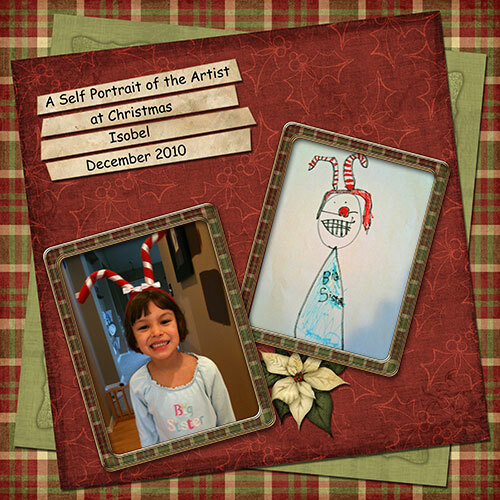 This year will be a highlight because it will be Isobel reading the story! Merry Christmas to all my readers. I really do this blog for myself and my family, but I so appreciate all the friends (real and imaginary!) that I've made through blogging. May God bless you all this coming year. I had an epiphany at 2:00 a.m. this morning. I have been stressing out about getting my Christmas knitting done. 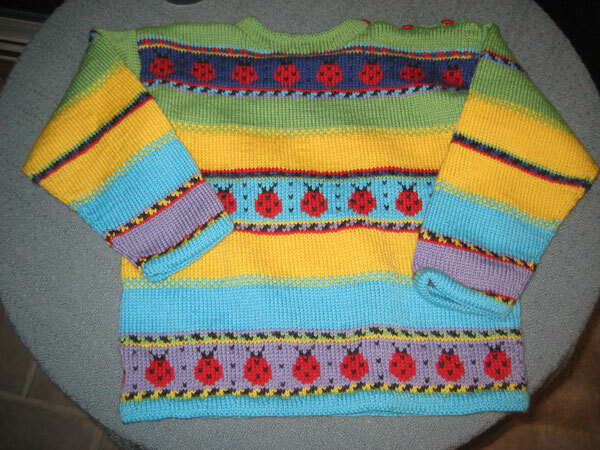 I'm making sweaters for the girls, as usual. 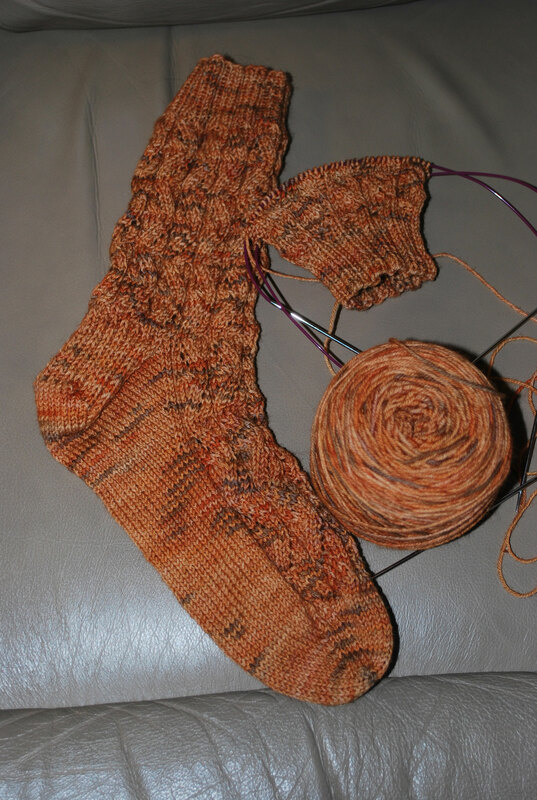 Ivy's is done (picture to follow), but I still have to finish Isobel's. I finished the body last night and calculated that if I spent every spare minute between now and Christmas, I might get the sleeves done, the steeks cut, sleeves sewn in and front and neckbands knit up. That would mean skipping our annual spinner's party today and literally knitting every spare moment I have. As I was tossing and turning at 2:00, I realized therein lies madness. This is SO not what the Christmas season is about. 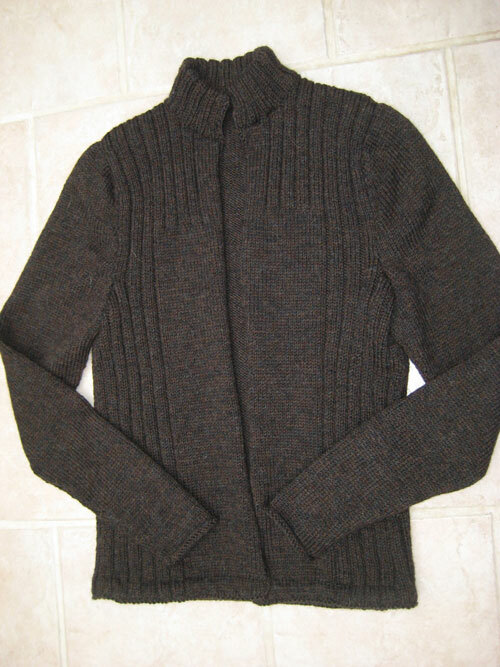 I would hate and resent every stitch I put in and that's not the love I want knit into this sweater. The sweaters will be appreciated just as much two weeks after Christmas – maybe even more when they don't have to compete with toys under the tree. I'm happy to say that common sense has prevailed and I will be enjoying the last week before Christmas. I'm pleased as punch how it turned out. I do think, though, that next year's Christmas sweaters will be a little bit less ambitious! 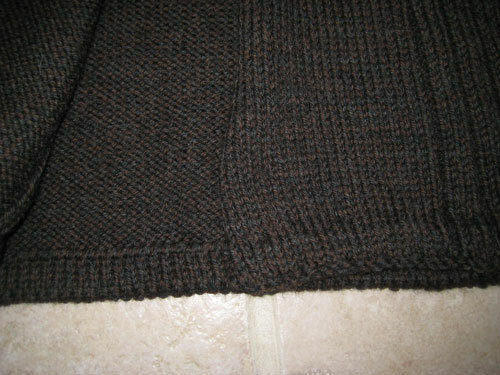 As it lay blocking I had a little bit of a panic attack looking at how sloppy it looks with the neckline steeks cut. But I have to remind myself that's what Ivy's looked like and it turned out just fine. Steeking is a little bit like blocking lace – an act of faith. And not just any old act of faith, a HUGE act of faith. I took Ivy's sweater with me to my monthly sewing getaway last week and I thought several ladies were going to faint when I took the scissors to it! This weekend should prove to be a lot of fun. Barring any unforeseen illnesses (one side effect of having a kindergardner is that she brings home every germ floating around out there!) 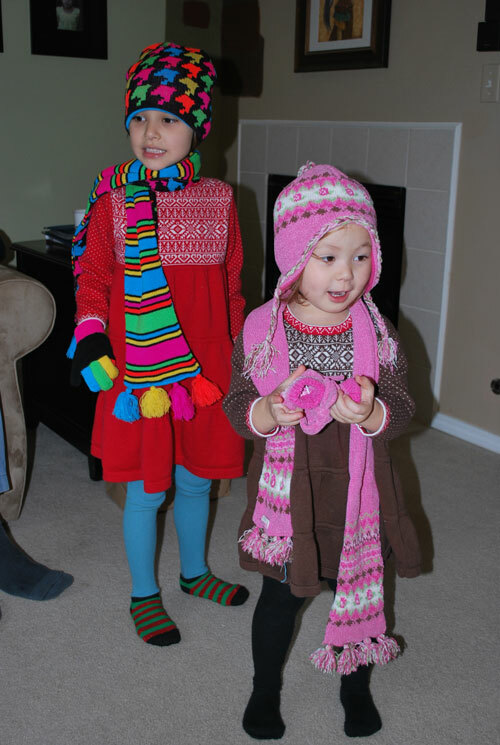 the granddaughters will be coming to spend the weekend with us. 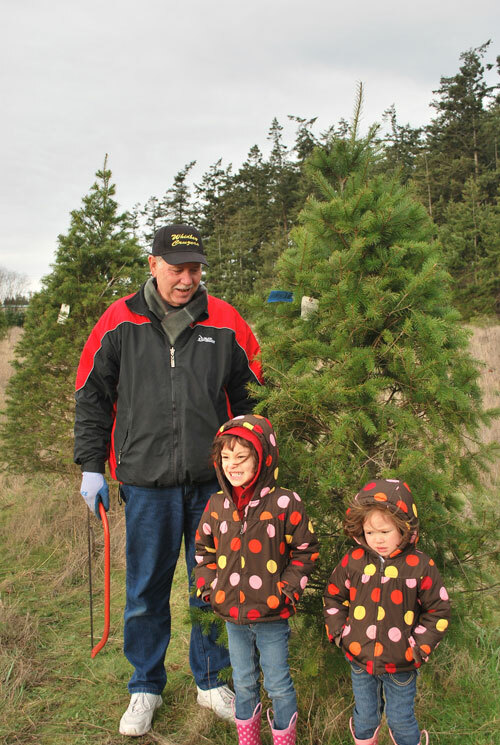 We will be taking them to cut a Christmas tree and then they will help us decorate it. Should be fun having a 3 and 5-year old help out with that! If all goes well, we will also fit in a trip to the local Christmas Village. We were hoping that would give Ben and Abby a chance to get out and have some fun, but they are both battling colds and may enjoy the opportunity to just rest. 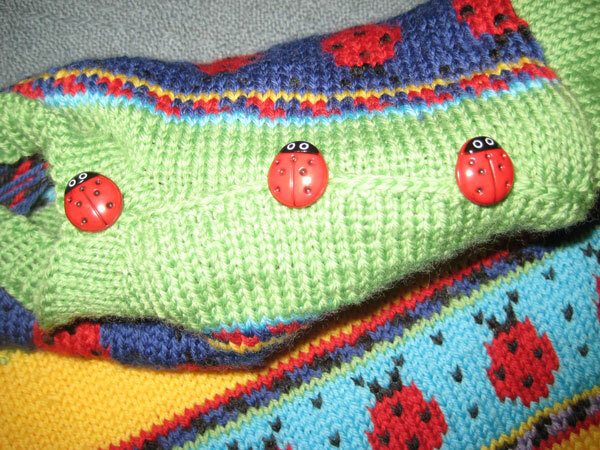 I'm off to browse through some patterns – I think I may just cast on a sock today. Believe it or not, I only have two projects on the needles – Isobel's sweater and a vest for me that has been languishing. I suppose I should take a look at the vest. I'm pretty close to being done with it, but I think I need the rush of casting on a new project! Can anyone identify with that?? I leave you with a model shot of my son's sweater. I think he was pleased – at 6'6", it's very difficult for him to find sweaters with sleeves that are long enough. He looks quite handsome, doesn't he? It looks as if I'm finally coming to the end of the road on Ben's Cambridge Jacket. 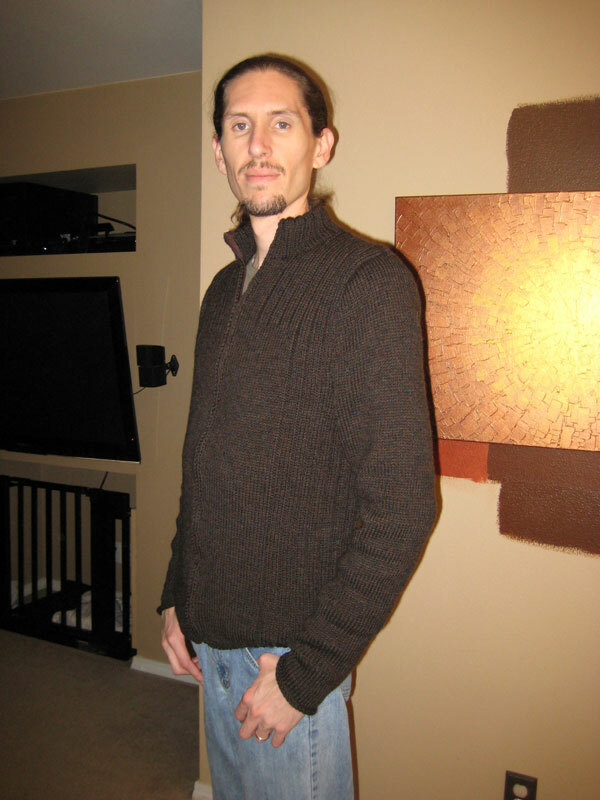 Issue #1 – My original intent was to spin the yarn for the sweater. After months of spinning and plying, I came to the humbling realization that I am just not that good a spinner yet. While the yarn I produced was quite lovely, it was too bulky for this pattern. I ended up buying Cascade 220 for the project. Issue #3 – In addition to the problems associated with altering the armhole depth, I knew I would also have to alter the sleeve width. In reading the Ravelry comments (whatever did we do before Ravelry?? ), I saw that the width of the sleeve was way too wide. I narrowed the sleeve by about 3 inches, and with these two alterations, had to rework the sleeve cap calculations. After about three tries of coming out with rather bizarre looking sleeve caps, I found a trial version of Sweater Wizard, downloaded it and met with success. I think a full version of this will be in my future. I'm going to go out on a limb and predict that this will be the end of my issues. I've already tried it on Ben and it fits him beautifully. Thanks Ben for your patience. He only had to wait a year! Christmas knitting continues on and I'm starting to get just a tad panicky. I have one sleeve left to do on Ivy's, but that should be the work of only a few hours of knitting. 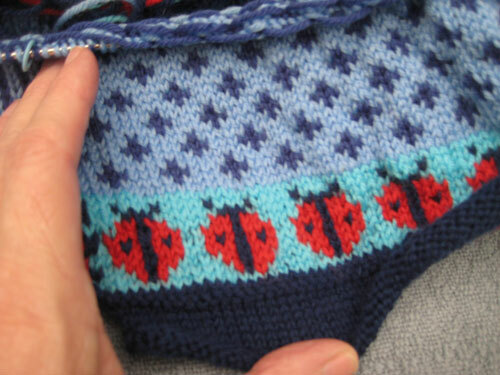 I've started Isobel's and the worst part of knitting the little ladybugs is over. I do so hate carrying three colors in a row! But I am finding that the stranded knitting tires my hands out, so I hope I will hold up. 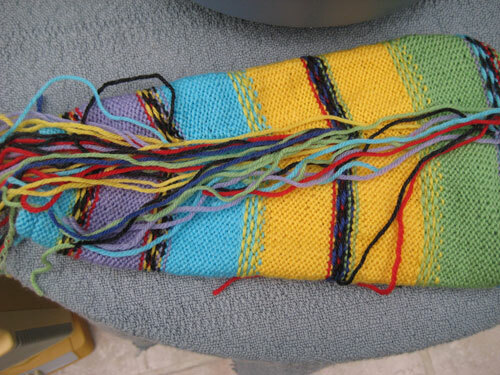 I am remembering one of the downsides of multi-colored knitting – ends!! Who would think that a tiny little sleeve could have that many ends to weave in? Thank goodness Isobel's sweater is a cardigan and so I can whack those ends off. In digital scrapbooking news, I received some incredible encouragement. I belong to a subscription through Scrapper's Guide. Every month I receive at least one (and sometimes two) kits and at least four video tutorials. Linda Sattgast and her crew are absolutely the best teachers for digital scrapbooking and I highly recommend her classes. Every month she picks a "top pick" of a scrapbook page using that month's kit. My page, Cookie Time, was chosen as the top pick for November. There were so many amazing pages in the gallery that I was very flattered and encouraged to be chosen. I had predicted that our snow would be gone by Thanksgiving, but by last Thursday we still had roads that were icy and many were unplowed. We decided not to risk having the family drive, so postponed our personal Thanksgiving until Saturday. But on Thursday hubby and I headed over to our community Thanksgiving. This is the 9th year of a community celebration and it's grown to serve over 5,000 people! We volunteered to deliver meals to those who couldn't get out and ended up delivering 17 meals on icy, snowy, hilly roads. Forest came through like a champ! I do miss my MINI at times, but was very thankful for the new car this year! Monday we're taking it back so they can install the heated leather seats. I'll like it even more then! This car doesn't have a lot of bells and whistles, but that was one thing we both insisted on. We had them on the MINI and we were thoroughly spoiled. 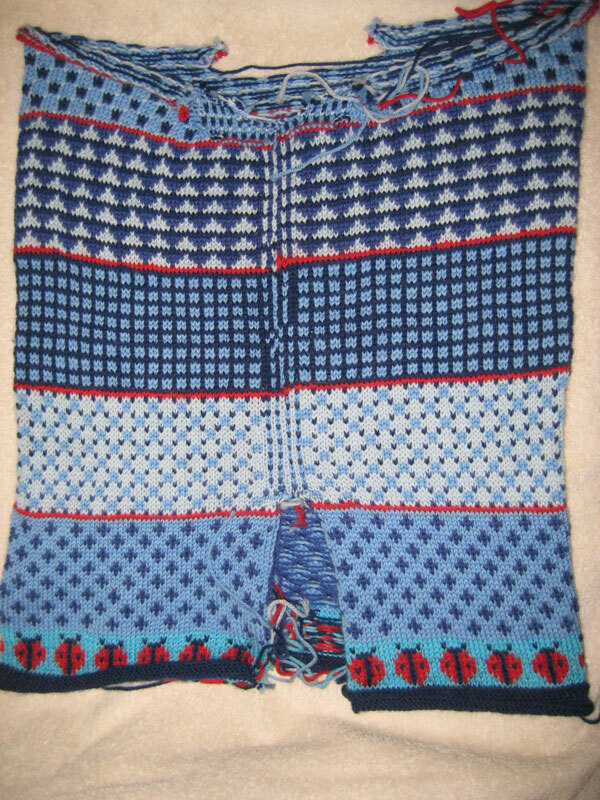 Off to do more color knitting – hubby and I have gotten hooked on the TV series "Heroes". With four seasons of at least 21 episodes each, that's a lot of knitting time! I'll just be glad when Hiro learns English so I don't have to keep looking up to read subtitiles.